Your pup’s day starts with group play and pool swim time with up to 10 other dogs at a time. We carefully select dogs for each group to insure they have compatible temperaments and are close enough in size to help keep play time safe for everyone. They’ll be able to swim, romp, play, socialize and burn off their excess energy. Your dog per request spend his/her downtime resting in an individual kennel. Your dog will be challenged not just physically but mentally, so you can rest assured that when you pick up your pup at the end of the day, they’ll be happy and content! At a small additional charge we can ensure your dog is given an extended outside walk for about 30 minutes before each group play session.We never punish your dog for indoor accidents! We know that each dog is unique and has its own special needs. We tailor your dog’s training and play time to fit their particular temperament. 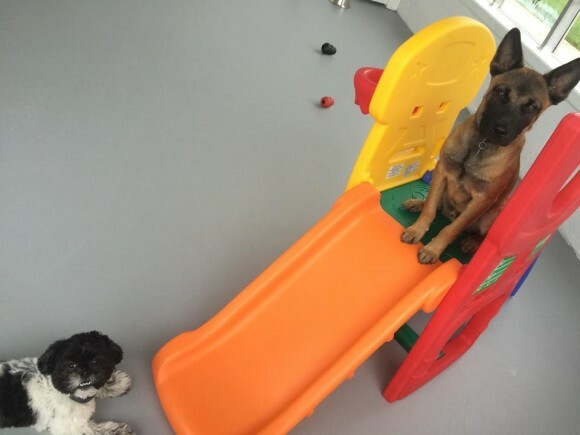 We know some dogs just don’t play well with others, so we can spend time with them to work on social skills or substitute group play with individual training or alternative exercises. If your dog has a specific behavioral issue you’d like us to address, our Dog Day Care Center staff will spend time working on that as well. If you have a question about whether we can help with a particular problem, never hesitate to ask! * Regular Dog Daycare packages expire after 2 month and there are NO refunds. * Packages are prepaid and multiple dogs must live at the same address to qualify for multiple dog rate. Outdoor walks with expert dog handlers. Meals and treats as provided by owners. * For overnight stays, please refer to our Dog Boarding page.